When designing a website, what do you consider the best image format to use for a particular task? I always find myself in a dilemma when trying to figure out what format to use for a specific task...like for example, should I use .jpg all round? or, when and why should I use a .png? On the other hand, Play.com use a .gif for their website logo (Example), but use .jpg for their website products (like Amazon) (Example) and as far as their main page goes, they dont have any .pngs on it. So what formats should I use for my websites? and why should I use them? Thanks CruellO for this link for explaining the differences, and also Dustin for giving reasons on what to use. JPEGs are for photos. I see JPEGs with text in them occasionally and they just look awful. Text is best for text, otherwise use PNG. If it's not a photo, but you want a graphic of it, use a PNG. 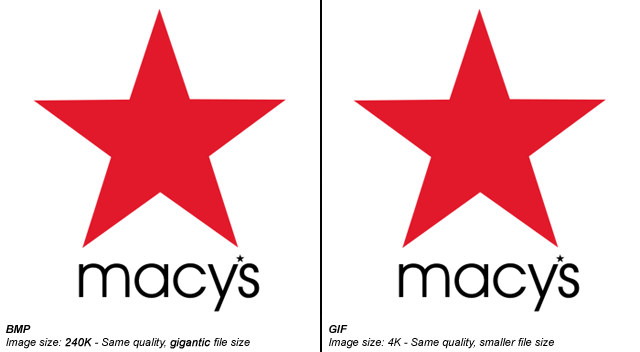 A PNG is almost always smaller than the equivalent gif and will not lose quality like a JPEG file. A PNG equivalent of a JPEG will typically be a lot larger (assuming it's photorealistic). There may be times where this is still desirable. PNG does allow for 8-bits of transparency, but if you have to support IE, you'll find that they continually refuse to support that correctly. They do support a single bit of transparency in an 8-bit image (essentially the same as gif) as far as I know. 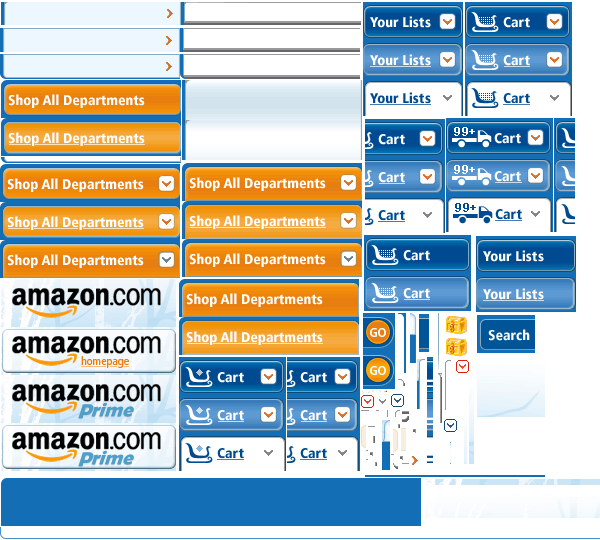 There are also numerous hacks to get 8-bit transparency to work in IE. I've never bothered, myself. Important Note: Photoshop does not support Alpha Transparency for PNG-8 files. (Damn you, Photoshop!) There are ways to convert Photoshop PNG-24 to PNG-8 files while retaining their transparency, though. One method is PNGQuant, another is to save your files with Fireworks. Despite myths to the contrary, PNG outperforms GIF in most aspects. PNG is capable of every image mode of GIF apart from animation, and when using the same image mode, PNG will have better compression due to its superior DEFLATE algorithm compared to LZW. PNG is also capable of additional modes that GIF cannot do, such as 24 bit color, and alpha transparency, but this is where you may run into problems on the web. Alpha transparency has compatibility issues with IE6 that are well documented (though hacks exist to get around). 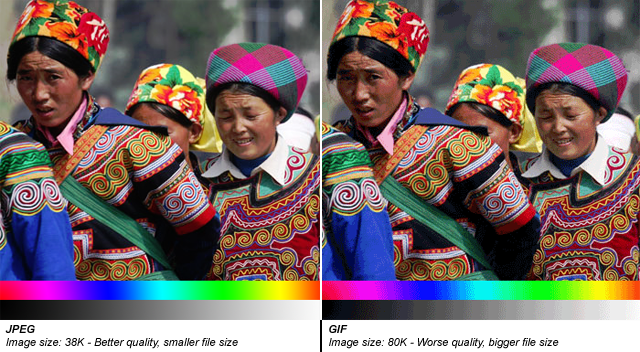 For best compression in PNG for the web, always use a palette mode. 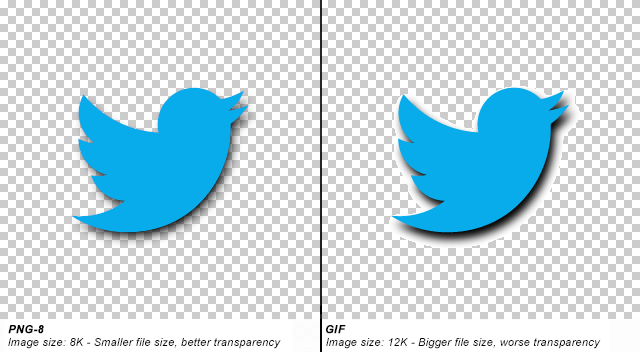 If you find PNG files are larger than the equivalent GIF files, then you're saving the PNG in 24 bit color and the GIF in palette mode (because a GIF is always in palette mode). Try converting to palette mode first. If you find that your PNG files with transparency aren't working properly in IE6 while your GIF files are, then you are using 24 bit color + alpha transparency in PNG and palette mode with a transparent color with GIF. You will have to make sure that you convert your PNG into a paletted color mode with a transparent color. PNG also has other modes such as palette color with alpha transparency in the palette. Modes such as this cannot be used in Photoshop. If you are storing or presenting a large number of images the new Google WebP format might be worth considering as it is 25% smaller than PNG/JPG. Note this is not supported by all browsers at the moment. NB. This came out in 2010 after this question was posted. Not the answer you're looking for? Browse other questions tagged image-formats or ask your own question. What image type should I use when? GIF, JPG or PNG? Is It possible to display a psd file using php? Which graphic file formats are supported by browsers? 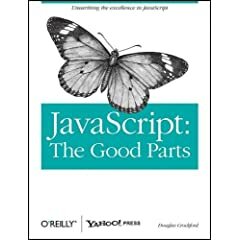 Which Image Formats does JavaFX Support? How to get the format of image with PIL? How to decode QQD image format?